I think one could argue that Sikma did leave a mark on the game. 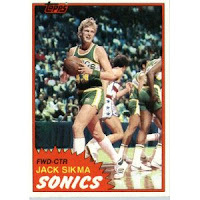 A Google search for Sikma Move will bear that out. I remember to this day Mr. Jacka teaching me the "Sikma Move" at Tahoma Sr. High School. As a 5'10" Sophomore destined to grow no taller, it had little impact on my basketball career, but just about every junior high or high school basketball coach teaches the inside pivot to their post guys - and inevitably calls it the Sikma Move for the tall, lanky fella that popularized it 30-odd years ago. Ditto what Hacksaw said. I got taught that move over and over and over again, and even in Minnesota they called it the "Sikma Move." Probably not enough to really move the needle on his HOF candidacy, but it is worth considering. Nice write-up, by the way, I wish Sikma could get more love for his career.